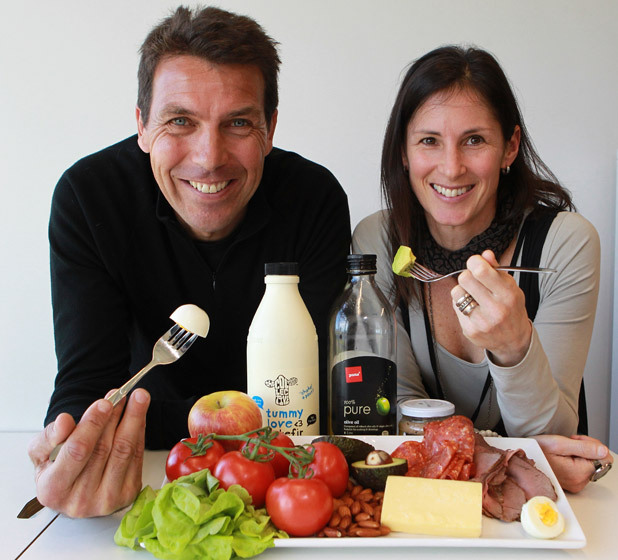 It’s been a big week in New Zealand on the ongoing debate around fat in the diet and health. Professor Mann released his Lancet invited letter (read “me and editor reckon that LCHF eating is a bad idea so here’s a letter”). This of course sparked a good deal of interest in the low carb eating area – which I guess was predictable, but the opposite of their intentions! The follow up media was interesting. Here’s the article written this week that gives both views. I guess you can judge the positions accurately from a journalist who took her time to do research on both sides rather than copying and pasting the Otago University press release. Next out of the blocks was Otago University’s Dr Lisa Te Morenga – who at the “Nutrients not food” one day symposium last week showed on her slides (twice) a photo of Dr. Caryn Zinn and myself and asserted, without evidence, that we and the rest of my research team “had no idea how to understand research evidence, and cherry picked the data to suit our hypothesis” and “The recent submission to the Ministry of Health around the proposed healthy food guidelines were a good example of this”. Ouch, we disagree. Feel free to read and comment on that summation of the evidence, as we haven’t had heard anything from anyone else rebutting the science we present. Now it’s fair to say we haven’t really been best friends recently. A few face-to-face interactions have pretty much nearly come to blows, voices were raised and lots of accusations made. The one that sticks most is that I am not qualified to talk about nutrition because I am not a trained epidemiologist (despite having published quite a bit in what you could call epidemiology) and am going to harm everyone because they will start eating more fat. The first thing is that the recent debate we had at the Auckland Museum (the Cult of Food – late at the Museum) is out on Radio New Zealand. You’ll get the audio there. This is a great listen and very well produced. But in all fairness and respect, Professor Jackson came up to our research centre last week and spent 4 ½ hours talking in depth about the issues around fat and saturated fat. We gave points and counter points. This was most productive for us, and hopefully Rod. He does make some good points that we agree with. First, that occasionally we have erred into being photographed with ridiculous non-foods – like the time I was pictured in front of a plate of processed sausages, and another when someone (incorrectly) quoted me as walking around the office sculling a bottle of cream. We acknowledged “to try harder” to get the real food message out as these do not accurately reflect our position. Second, it is plausible that diets high in sugar and saturated fat have a negative synergistic effect. That would mean that restricting saturated fat under these conditions might have a beneficial effect on health. Just to be clear though, if true, this doesn’t make fat the sole enemy; it makes the Standard American Diet the enemy. The same diet minus saturated fat is still refined food. Thanks Professor Jackson for your humility and willingness to engage in a sensible scientific discussion. Rod agrees fat itself isn’t the problem, but has a real problem with saturated fat in the context of cardiovascular disease – his specialty. He agrees that there may have been unintended consequences of the low fat diet in other disease areas. He still maintains that the problem with the low carb high fat diet is that people will eat more saturated fat than is healthful. Anyway, that was the highlight of the week and our team is now racing away thinking of several new studies we could start to test how fat, especially saturated fat, might flux differently in different diets. We still maintain that in the context of a low carb whole food diet, a balance of saturated fat, poly-unsaturated fat and mono-unsaturated fat (as they occur in nature) is not an issue for health. Part 2 – A point by point discussion of where the latest evidence is – and a counter point response to those who continue to demonise LCHF. How are we going to get the crows that clean up road kill, to leave the fat behind. Ok, so this is generally a recipe blog, but for my NZ followers this article by Prof Grant Scofield is an insight into the on going academic debate around the promotion of LCHF whole food eating vs the low fat high carb Standard American (NZ) diet that is happening right now. The letter from Jim Mann et al. you twitted is full of fallacies. My view on one of them. It’s great that Rod has engaged in the debate! I do hope that the outcome of this first visit by Jim to your office will result in (1) ongoing meetings between you both at each others offices (2) to continue to discuss the different perspectives as well as the commonalities – and (3) publish a joint blog or newsletter or something, so all us confused folks who are not scientists or epidemiologists or nutritionists can weight them up as we consider if LCHF really is for us, or not. In the meantime, keep up the great work. How well does Rod declare his involvement with Unilever projects?